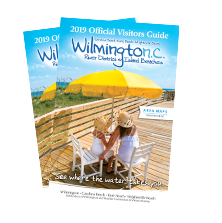 Wilmington, North Carolina, and its island beaches are known for Southern goodness, world flavors, top chefs and homegrown freshness. Get ready to eat—and eat, and eat. Seaport history stirs cosmopolitan flair into the local food culture of Wilmington, North Carolina. Passionate cooks inspired by devoted farmers and anglers satisfy every craving. Head to local eateries throughout the area to see what all the buzz is about. Days may begin with bacon cinnamon rolls, chocolate-filled croissants or tender biscuits—don’t forget the molasses. People come from all over the world for warm, glazed doughnuts from Britt’s Donuts, a Carolina Beach Boardwalk classic for 75 years. 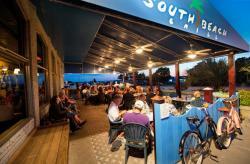 Visitors head to Wrightsville Beach for fried shrimp on a pier built over the sea. In uptown Wilmington, James Beard Award nominee chef Keith Rhodes has become a local legend for the ginger-spiked crab cakes he serves at Catch restaurant. Downtown’s Front Street Brewery boasts nationally ranked craft beers and more than 70 premium and rare bourbons. The American Bourbon Association lists the pub as one of the “great bourbon bars” in the United States. Throughout Wilmington’s beach communities, professional chefs share their artistry by inviting foodies into their kitchens to take cooking classes. Aspiring mixologists can also attend a cocktail seminar or learn to make wine. Get recipe tips from growers and food purveyors at lively farmers markets in Wilmington, Carolina Beach and Wrightsville Beach. Stands stock rainbow chilies, goat cheese, spicy pickled peanuts, Italian pastries, chocolate muscadine wine and other local flavors. 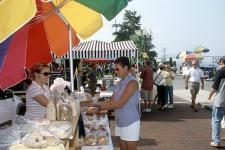 Learn to shop downtown Wilmington’s Riverfront Farmers Market on the Top Chef Farmers Market Tour & Cooking Class. Provisions purchased along the way are used afterwards in a hands-on cooking class with one of the city’s best chefs. Culinary Adventures tours also include cocktail and restaurant walks that mingle yummy samples, local food history, cooking tips and the inside scoop on Wilmington’s dining scene. At Carolina Beach, Tasting History tours blend the island’s past with delicious stops. Hear Civil War stories and discover where to see a shipwreck at low tide, all served between varied nibbles, say clam chowder, fresh mozzarella cheese or shrimp and grits. Creamy fudge might accompany beach boardwalk nostalgia, with fun facts sprinkled in along the way. Welcome to Hollywood East, where the stars eat. Wilmington’s major movie studios have led to a prideful nickname here, Wilmywood. While filming Iron Man 3, Robert Downey Jr. was a downtown Wilmington regular. His co-star and a self-proclaimed foodie, Gwyneth Paltrow, scheduled a cooking class at Catch and wrote about the restaurant on her lifestyle blog, GOOP. Jennifer Aniston and Katie Holmes favored seasonal menus at Port Land Grille near Wrightsville Beach, another celebrity favorite. Will Ferrell enjoyed a meal at South Beach Grill in Wrightsville Beach, and Melissa McCarthy stopped by Havana’s after a day on location in Carolina Beach. So many stars have dined at uptown’s Bento Box that sushi rolls created just for them remain on the menu. Colin Firth, Blake Lively, Michael Cain, John Travolta, Emma Roberts and Susan Sarandon are just a few of the numerous stars who have savored the Wilmington cuisine scene at restaurants and markets. Many loved the area so much, they return just for fun. Wilmington’s plate is not full yet. Festivals and events celebrate the area’s abundance, too. Catch the Wilmington Wine & Chocolate Festival in February, Greek Festival in May, Port City Rib Fest in August, Pleasure Island Seafood, Blues & Jazz Festival in October, the Polish Festival in November, plus two Restaurant Weeks (spring and fall) and two Truck-A-Roo food truck rallies every year. Spring’s Wilmington Wine and Food Festival showcases a grand tasting of vintages and victuals as well as craft beers, barbecue and locally produced bourbon. Fall follows up with Wilmington Beer Week’s pairing dinners and the Lighthouse Beer and Wine Festival. 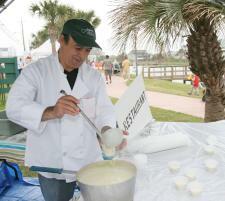 In October, Taste of Wrightsville Beach features island restaurants, craft beers and fine wines. Chefs get their game on during assorted competitions including the Pleasure Island Chowder Cook-off and the Fire on the Dock bracket-style chef tournament. Search local food events to map out your savory tour of Wilmington, North Carolina. Find the perfect accommodations to rest up in between meals and plenty of activities to burn off the calories from those bacon cinnamon rolls.